My name is Billy Stewart and this is my fourth year here at Notre Dame. 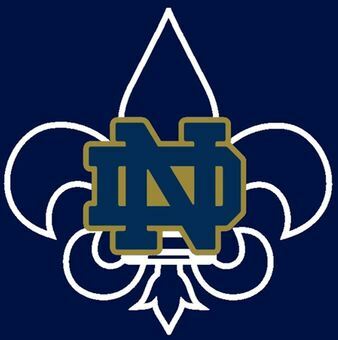 Throughout my four years, I have played on many of the school teams that Notre Dame offers, and have been involved with many of the clubs. Currently, I’m in the STEAM Club and I wish to work closely with the people in charge of this group so that our student body can better understand the opportunities that those specific careers hold for students. Also, this year I wish to increase the school's community involvement, with things like the Angel Campaign, our School Floodlight Games, and 'buyouts' later on in the year. I hope to see not only increased involvement from the whole school, but more opportunities for the students to attend these events. After all, Notre Dame is like a big family. Hello Notre Dame community, My name is Keziah Oduro, one of this year’s Student Council Co-Prime Minister. I just want to thank the student body for voting me in and I am so excited for the school year ahead. This will be my fourth year on student council. This year’s council has a lot to bring to the school that will grow our community and make lasting memories that will hopefully touch all of you. Don’t be afraid give any suggestions, we are always willing to hear out new ideas. Throughout last year, I wrote about STEAM’s powerful debut year at Notre Dame. The momentum the club carries is far from slowing down, demonstrated at the 2018/19 STEAM 'Kick-Off Meeting', letting ND know that, once again, the club is talking on the year full STEAM ahead. 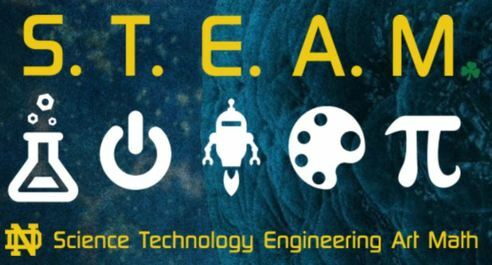 On September 19th, interested students were invited to the lecture hall to sign up for STEAM and to hear from the wide array of teacher advisors and some past members about what this year has to offer and what STEAM is fundamentally about. 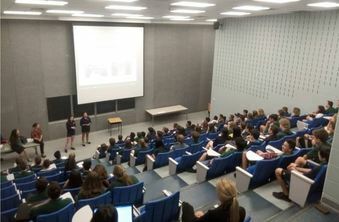 Around 90 students attended this meeting, and more are on the way. The meeting opened up with an introduction of the teachers involved, including Mr Mikitzel and Mrs. Kerwin (the Head Teachers of the club), Mr. Bozzelli, Mrs. Dussin, Mr. Giusti, Mr. Vicic, Ms. Tambasco, Ms. Rodriguez, Ms. Featherstone, and Mr. Nason, a group that will only grow as time goes on. An example of this that we saw a lot of last year was the Horticulture Club, which allowed students interested in horticulture, technology, and science of any kind alike to come together and work on various garden initiatives.“As a new teacher member of the STEAM Club, I’m excited to work with all of the students in the various STEAM areas and see what amazing things the students come up with!” Says Ms. Tambasco. “I look forward to the collaboration between all of the areas of interest and I hope that we are able to help the community with the ingenuity that comes from the club." On top of these focused clubs, where members will be the ones to learn and explore the world of their chosen domain(s), STEAM has made it a priority to continue with their community outreach events throughout the year, already having the ND STEAM conference for elementary students to attend scheduled, and much more to come. And, of course, we can’t forget about the project that STEAM is very enthusiastic about which has been in the works since the end of last year, the electric car. Students with interests in engineering, manufacturing, computer science, art, (the list goes on) are invited to help out the Electric Car Team, including the four Grade Representatives for the project. 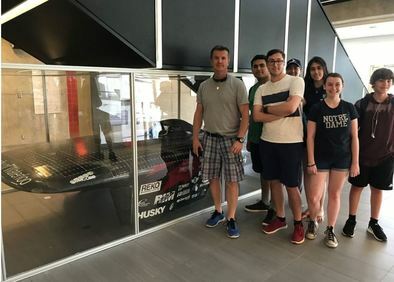 Mr. Vicic will pick up the motor and wheels September 29th at the fall kick off race, and he and his team of representatives hope to enter the finished car in the University of Waterloo Electric Car contest this May. On the morning of Tuesday, October 16th, Notre Dame Catholic Secondary School will participate in a special ceremony to bless and unveil ‘The Friendship Bench’, the first of its kind in Burlington. Notre Dame will join with schools across Canada in recognizing the importance of connecting and supporting each other so that no student feels alone. Sam Fiorella, one of the founders of the Lucas Fiorella Friendship Bench, will be attending and speaking at the unveiling ceremony. The Friendship Bench was created in memory of Sam’s son, who during his 2nd year of University, took his own life after silently battling with depression. Despite his silent suffering, Lucas dedicated himself to reaching out to fellow students. “It started with him saying ‘hello’ out of the blue,” reported many of his friends. It’s in that spirit that the Friendship Bench was created. The Yellow Friendship Bench also serves as a reminder to sit, breathe, talk and to create awareness around mental health. A plaque on each bench links students to yellowisforhello.org, which provides resources for mental health support services in the area. Notre Dame Catholic Secondary School is fortunate to have received two yellow Friendship Benches, one to be located outside the front entrance and the other to be located in the spectrum. Students are encouraged to use these benches as a way to connect with each other as it is the school’s hope that every student will feel supported and cared about. Notre Dame Catholic Secondary School would especially like to thank the Burlington Knights of Columbus, Council 10061, for their generous donation and support in recognizing the importance of student mental health and connecting with one another face-to-face. High School. The one thing we dreaded most in elementary school… and yet here we are, grade 9. It seems like a big jump, and a bucket load of responsibility, but really, I'm sure it will be fine. Scary and slightly nerve-racking maybe, but I'll survive. Getting out of the car on the first day was probably the worst feeling... ever. The adrenaline rush you get when your moms car stops moving, and you're suddenly not at your house anymore, but at a high school filled with older teenagers. You slam the car door shut behind you, and grab your bag from the trunk. Gaze up at the school and walk toward the doors. As you reach for the metal grey handles, your teeth start chattering. You walk into the school to look for your locker, and your stomach starts to overflow with butterflies. Scariest 10 minutes of my life. Honestly, why hasn't someone made this into a horror movie yet? But jokes aside, it wasn't so bad, it's just something you have to get used to. New things tend to scare us sometimes. I could not believe how tired I was after the first day. I literally sat down the whole day, except for walking to and from classes, so why was I so exhausted? As a former grade 8, I am used to taking 15/20 minute recesses in between classes, having time to walk, stretch, etc; however, in high school this is not the case, you rarely ever move. I'm not gonna lie, but I was extremely drained after the first day of school, and certainly had no trouble falling to sleep that night. Although high school wasn't exactly what I had expected, Notre Dame itself isn't so bad! The school spirit here is madness, everyone here participates and shows pride in their school, and all of the kids are so welcoming! The teachers are super friendly, and love when I ask for help, they really do want to help me to succeed. Over the past few weeks I have seen and done so much. I've joined a couple of clubs, made some really nice friends, learnt where the washrooms were, and overall had an amazing beginning of the year. Even though I am nowhere near the end of this semester, mind you year, I have had a wonderful time at Notre Dame so far, and hope to continue this happiness throughout the next few years. If I could go back to my grade 8 self and tell her one thing, it would be to stay positive and don't stress. It can really be quite nerve wracking coming into a massive school, with a whole bunch of new people and older kids, but it tends to make us stress more than we should. Yeah, its new, and yeah, the older kids are super intimidating sometimes, but the new will become old over time, and the older kids can be super nice if you would simply say "Hi." So if I've learned anything over the past 4 days, is that you have to relax, try new things, and be open to learn something different. Heading into grade twelve, it’s hard to believe it’s the last year here for me. Sometimes it feels like nothing has changed since that first day of grade nine. Although, I’m happy to say that I’m much better at navigating the halls now. Things are also a lot less hectic; I know my courses, my teachers, and have a routine set up. Once the first day arrived, as hard as I had been trying to cling to summer, the school routine settled in pretty quickly. It’s crazy to think we’ll all be heading off to post-secondary soon. Grade-school has been the past twelve years of my life, and it’s weird to imagine that I’ve only got this year left. But, as scary as change can be, I’m more excited than anything. New faces, new places, and new challenges to overcome. I think unknowns are good—they keep life interesting, keep us trying to learn and push forward. If I had known in grade nine everything that was going to happen in High School, know all the right things to do/places to be, it would have been a really dull experience. I say, smile at the things you don’t know. On the first day of grade nine, did you accidentally enroll on the attendance for a geography class you didn’t have (not saying this has happened to me)? Don’t worry! It’ll make a funny story later! Did you forget which locker was yours and try and open somebody else’s (again, not saying it’s happened to me)? Yeah that one is embarrassing, but I’m sure you’ll remember where your locker is afterwards! If it’s your last year or your first, just make the most of it. Embrace everything from the dreaded math homework, to the strange-hallway-smells, to the crammed-full bus, because it really does go by fast. Enjoy High School, and make whatever comes next just as good. Notre Dame's first Floodlight Game of the 2018-2019 school year has come and gone and though it wasn't the outcome everyone wanted it was still a success. 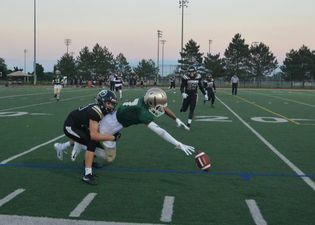 Though the Irish did not come up victorious, everyone truly won as the Notre Dame Community was able to make a $1500 donation to the St. Gabriels’ Parish Knights of Columbus and a $1500 donation to Habitat for Humanity “CATCH 18”. 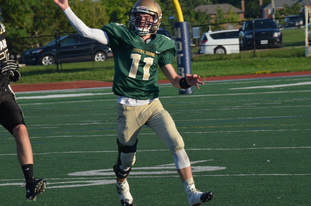 The Senior Boys Football Team played on Friday September 14th at 6pm against Holy Trinity. Friends and families flooded the bleachers very early on in the game, but there was still something missing. The ND students! 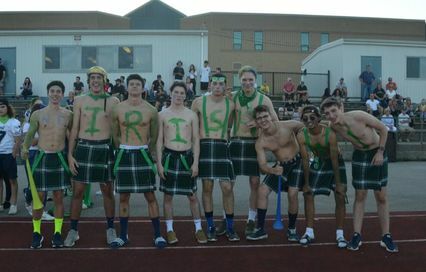 Slowly but surely many Notre Dame students showed up to cheer on the boys and have fun with their fellow peers. The beginning of the game was slow but quickly some action started happening, unfortunately it wasn't in favour of ND and by the end of the first quarter Holy Trinity was leading 14-0. But that was only the first quarter. With three more to go surely the boys could bounce back. That wasn't the case; Holy Trinity gained more points bringing the score up 28-0 at halftime. At halftime, we had a short but much-needed break from the game and instead we saw the Kilt Krew play their own game of football. At least they scored a touchdown in some much less intense surroundings. Students cheered on the Kilt Krew as they made their way down to the end zone. Also, at halftime we got a surprise show from the one and only Speedo-Man! Many were laughing, not at him but with him, as he ran around in field; He is truly a special Notre Dame tradition! Halftime came to an end quickly and football was once again the main subject to everyone. The boys had a much-needed break to regroup and clear their minds before heading back out to get something on the board. But at the end of the third quarter Notre Dame was still falling behind Holy Trinity 35-0. The last quarter was everyone's last hope. And though with not enough time left to win the game Notre Dame did put 7 points up on the board with a touchdown and field goal. 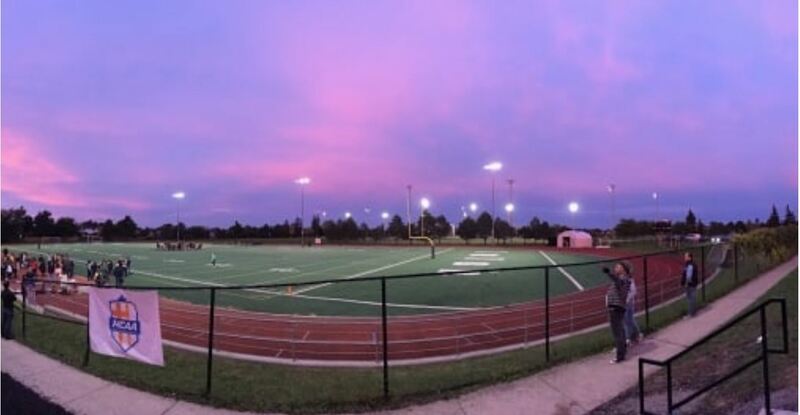 Unfortunately in ND’s first floodlight of this year the senior boys football team lost 35-7 to Holy Trinity. Though it wasn't what anyone wanted it was still a fun experience to cheer on the team. Win or lose everyone had an enjoyable time, and that Floodlight Game won't be the last of them. Notre Dame still has time to redeem themselves in our next 'Floodlight'. So good luck boys…. GOOOO IRISH! Comment était le premier mois de l’école? Les nouvelles classes, les nouveaux espoirs. Amusant, accablant, frustrant, concentré, triste, content. J’avais peur pour les photos d’école. J'aime apprendre. Toujours fatiguée. Cycle interminable. Très facile, mais aussi très fatiguant. ​Beaucoup de travail, j’ai toujours faim. ​Essayer plus, écouter plus, parle moins. 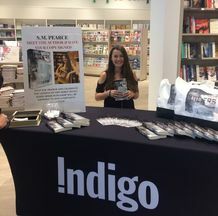 Sierra Pearce is a grade 12 student at Notre Dame and the author of the newly released novel Outliers. Sierra, who goes by her initials S.M. Pearce when she is writing, knows how to get involved in the school community here at Notre Dame. She is the coordinator of the Debate Club as well as participating in Manufacturing Club, Art Club, French Club, and tutors with the L2L tutoring program. While she is kept very busy with her many extra-curricular activities, Sierra is managing to pursue a career in Architecture in which she is able to exercise her creative genius. Sierra is passionate about anything that can be used as a creative outlet, whether this is her writing, drawing, painting or even metal-work. 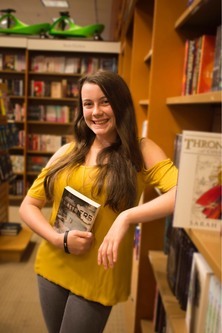 She is also an avid reader herself, saying that “I love to read, and while my favourite genre is science-fiction, I'll read pretty much anything I can get my hands on”. She names Eric Walters as her favourite author and first among her literary influences for his ability to craft characters and plots. Outliers is a Young Adult science fiction novel that follows the adventures of the heroine Renee and her friends in a futuristic, dystopian world, as they must keep their special abilities hidden from the corrupt government in order to survive. Their quest to remain unnoticed is hindered by the fact that Earth has become an uninhabitable wasteland and all civilization is living under a single dome. 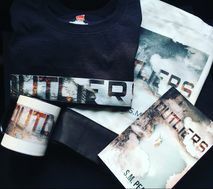 Outliers touches on some important themes such as the loss of innocence and the necessity for family and relationships. The novel also makes points about current issues such as mental health and discrimination. However, Sierra crucially notes that one must have read the book in order to fully understand it’s message. For anyone who is interested but not ready to purchase the book, there is a copy of Outliers at the Notre Dame Library as well as previews of the book online at iBooks, Amazon, and most other platforms. We would like to congratulate Sierra on her incredible accomplishment on behalf of the entire Notre Dame community. We wish her the best of luck going forward in her career as an author. To read a sample of OUTLIERS, or to purchase S.M Pearce's Debut Novel, click HERE! 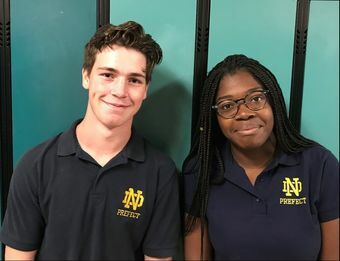 In June of last year, students in Grades 10 and 11 had the opportunity to apply to become a Prefect here at Notre Dame. The massive group of applicants underwent interviews and were eventually narrowed down to the 48 students that make up this year’s ND Prefects. “This not only means mentoring the grade 9's but also providing leadership and presence at all our wonderful events.” continues Mrs. Barros, our other teacher advisor, “Finally, it means bringing our Catholic values to life, by living it everyday as caring, loving, faithful leaders. On September 5th, the 2018/19 prefects were gathered on two school buses, ready to embark on the day that lay ahead of them. Our destination was McMaster University to partake in their Altitude (Achieving Leadership Through Integrated Teamwork, Unity, Dedication, and Empowerment) program for the day. The 48 prefects were split into three groups, then directed by the Altitude leaders to their designated stations. These stations included various team building activities, strategic puzzles, and ( a definite highlight) the climbing tower, where prefects were able to choose one of three climbing routes to conquer, tethered to an Altitude Leader who remained on the ground. After a pizza lunch and some down time, the Altitude leaders ended off the day by introducing the Prefects to various activities that the group will now be able to apply to their house group meetings, a fundamental part of the Grade Nine experience at ND. As the day drew to a close, the Prefects thanked the Altitude Leaders for the day, and embarked back to Notre Dame. They were sad to leave the day of excitement and community building behind, but overall pretty excited for some air conditioning. “The Altitude Day went exceptionally well. The leaders at McMaster praised the group, noting that they were one of the strongest groups that have ever attended the leadership training here.” Says Mrs Sneyd. Overall, the Altitude day has been chalked up to a success. Senior Prefect Travis commented that it was “it was a positive experience that advocated community and the Notre Dame environment”. So, don’t worry ND, it looks like you’re in good hands this year.